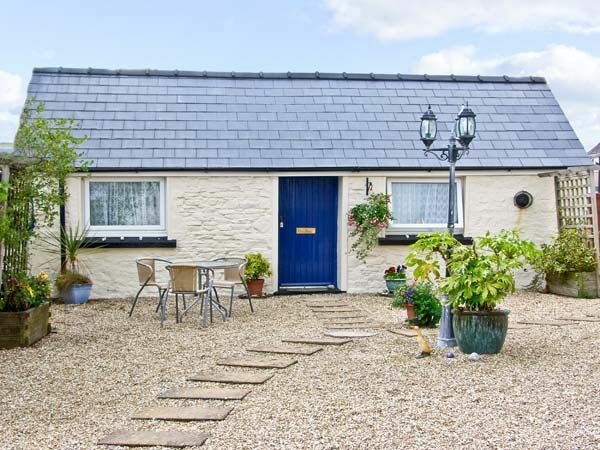 This cosy, detached cottage is located in pretty surroundings, 1 mile from the fishing village of Saundersfoot on the Pembrokeshire Coast in South Wales and can sleep two people. Star Cottage is a cosy, detached, single storey cottage located 1 mile from Saundersfoot, near Tenby, on the Pembrokeshire Coast. This cottage sleeps two people in one double bedroom, with an en-suite shower room with shower, basin and WC. The living accommodation is open plan, with a fitted kitchen, dining area and sitting area. Outside your cottage is a shared gravelled patio with furniture, along with shared use of a large lawned area with furniture. Off road parking is also available for one car. Within easy reach of lovely sandy beaches, Star Cottage is an ideal base for a romantic, coastal break. Amenities: Gas central heating. Electric oven and hob, microwave, fridge, TV with Freeview, DVD/CD player, WiFI, small library of books, games and DVDs. All fuel and power inc. in rent. Bed linen and towels inc. in rent. Off road parking for 1 car. Shared gravelled patio with furniture and BBQ, plus shared use of large lawned area with garden furniture. Sorry, no pets and no smoking. Village shop 3 mins walk, restaurant 1 min walk, pubs and restaurants 1 mile. Note: This property accepts a maximum of 2 people, including infants. Note: 1 mile walk to Saundersfoot on road without any pavement. Note: Due to size of the bedroom there is limited space each side of the bed and the door into the en-suite shower room does not fully open to narrow access. Note: cottage next to an A road therefore some road noise will be experienced. Town: Saundersfoot is a fishing village located on the Pembrokeshire Coast near Tenby, boasting a host of amenities and a pretty harbour. Enjoy the sandy beaches or enjoy walks on the Pembrokeshire Coastal Path. Tenby is home to ancient walls, stunning beaches and boat trips to Caldey Island. All ground floor. One double bedroom with en-suite shower room with shower, basin and WC. Open plan living area with fitted kitchen, dining area and sitting area. Gas central heating. Electric oven and hob, microwave, fridge, TV with Freeview, DVD/CD player, WiFI, small library of books, games and DVDs. All fuel and power inc. in rent. Bed linen and towels inc. in rent. Off road parking for 1 car. Shared gravelled patio with furniture and BBQ, plus shared use of large lawned area with garden furniture. Sorry, no pets and no smoking. Village shop 3 mins walk, restaurant 1 min walk, pubs and restaurants 1 mile. Note: This property accepts a maximum of 2 people, including infants. Note: 1 mile walk to Saundersfoot on road without any pavement. Note: Due to size of the bedroom there is limited space each side of the bed and the door into the en-suite shower room does not fully open to narrow access. Note: cottage next to an A road therefore some road noise will be experienced.